If you attended the HubSpot INBOUND conference this year, you’re well aware of the emergence of the flywheel and the demise of the funnel. 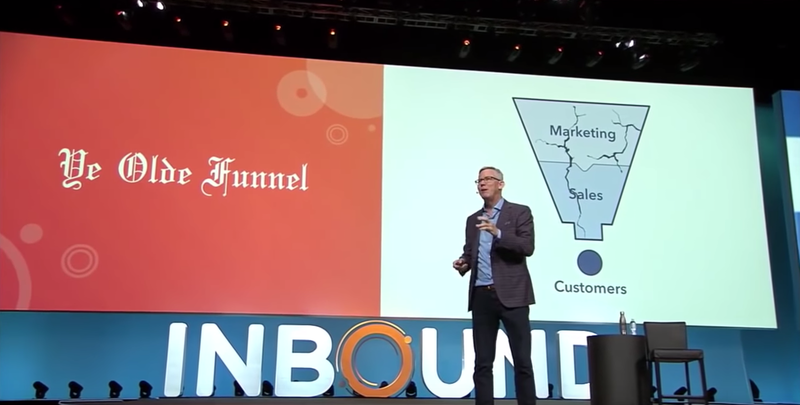 HubSpot CEO Brian Halligan made much hay of it during his keynote speech, and his speeches tend to set the tone for inbound marketing. If you didn’t attend and are wondering what a flywheel is, I’ll explain. If you need a larger primer on the inbound marketing process, we’ve got you covered there. He called it the Purchasing Funnel, but today you’ll see it most commonly referred to as the sales or marketing funnel. 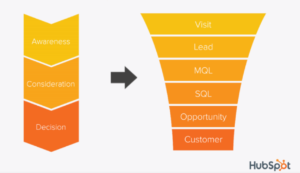 Turn the clock forward, and we’ve seen a variety of iterations of this funnel over the years, including HubSpot’s version that explains the buyer’s journey in three stages. 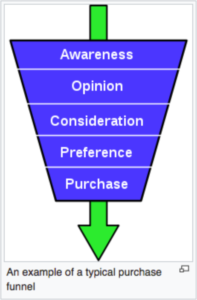 The top of the funnel (TOF) is the Attraction Stage, the middle of the funnel (MOF) is the Conversion Stage, and the bottom of the funnel (BOF) is the Decision Stage. HubSpot’s model was the basis of their inbound marketing methodology when the company launched in 2005, and since then, they have attracted thousands of businesses and helped them use this methodology to attract, convert, close, and delight customers through content offers, good content, and more. So why the change? Good question. During INBOUND, Halligan showed us a slide of a cracked funnel and told the 23,000 or so people gathered that in the funnel model, customers (those people you’ve worked so hard to attract, convert, close, and delight) are an output, or the last step. This can give rise to the mindset for many sales and marketing professionals, that once a prospect has converted to a customer, their job is done. But that’s the opposite of what should happen! In any thriving business, especially one that’s scaled from startup, customers are the most important part of an ongoing cycle of getting feedback on performance, improving service, getting repeat business, and providing the most powerful source of new business: the almighty referral by word of mouth. Halligan then brought out the flywheel, a large colorful wheel you could spin “The Price is Right” style. 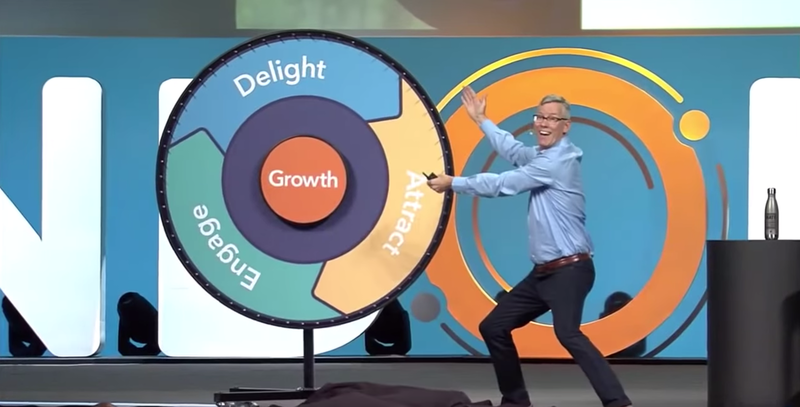 On the HubSpot Wheel, instead of seeing prices, you saw three words—Attract, Engage, Delight—surrounding the word Growth. Sure, it was pretty and all, but some of us in the audience were still confused about why this was better than the funnel. According to Halligan, a flywheel is very energy efficient–provided you remove the friction points that keep it from spinning. Once the friction points are removed, and the proper amount of force is used in each stage, a flywheel will spin for a very long time before it needs to be tweaked or given another spin. In other words, instead of your customers coming out of the funnel never to be seen again, you can use their momentum as promoters to help attract and captivate the next round of customers and so on and so forth. Ideally, it’s a perpetually never-ending cycle of customer satisfaction and word-of-mouth working in your favor to keep that flywheel spinning. Once you recognize the true value of your customers, you can switch up your marketing efforts to include more customer advocacy, referral programs, and other methods to get customers working for you, which, in addition to being more effective, is a lot cheaper than attracting totally new traffic who may know little to nothing about your product or service. He also provided these Google Slides and PowerPoint presentation as worksheets to help build our flywheel. 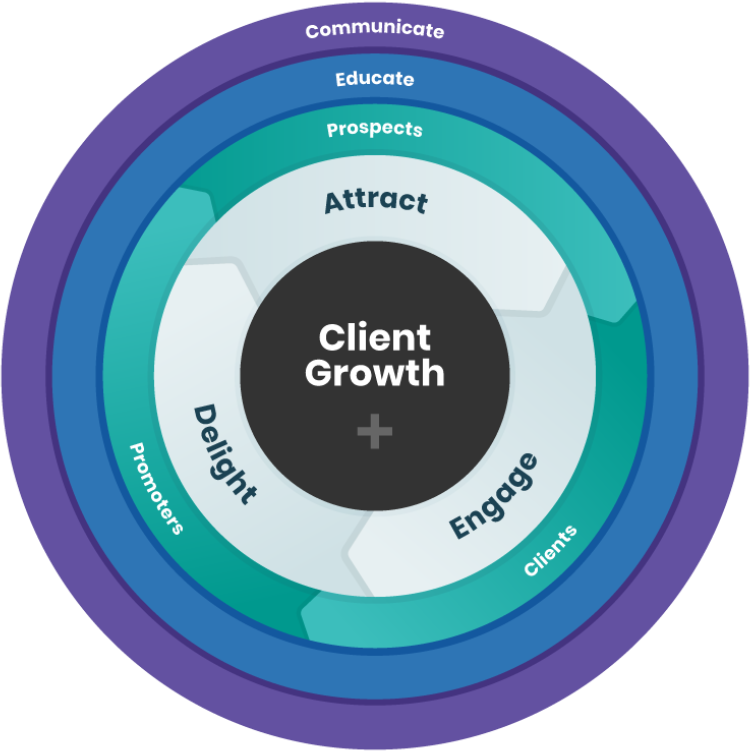 The goal: To look at all three stages of your flywheel—Attract, Engage, and Delight—and see where your efforts are weak, oppose other efforts, or are just misguided and not working to get customers to be your biggest advocates. When you’re creating your flywheel, it may be easier to figure out the steps you need to get your flywheel to spin (marketing tactics), but in order for it to spin effectively, you’ll need to make sure there aren’t going to be points of friction that make it come to a screeching halt. These points of friction are going to be different for everyone, but to begin, you can explore whether things your marketing team is doing is in opposition to the efforts your sales team is making. The process from marketing to sales and beyond needs to be totally transparent so you can figure out if there is any overlap or poor handoffs that create friction and keep the flywheel from spinning smoothly. As a HubSpot partner, we couldn’t wait to get back to the office and build our flywheel. We knew it would make our business stronger and we’re always looking to grow and improve. We got the marketing and sales team in a room, documented our key metrics, listed our friction points, and ta-da—introducing our beautiful new flywheel. It looks similar to HubSpot’s flywheel above, but where ours differs is in the fact that we realized we needed communication and education to be a part of our flywheel at every stage of the game. Why? We found that our main points of contact–usually marketing managers or directors–have a clear understanding of how Raka provides strategic partnership and helps them succeed in online marketing, but that there are lots of different ways to interpret “digital marketing,” “inbound marketing,” “lead generation” or other terms that describe some of what we do. When we discussed our own friction points we found our clients and prospects sometimes see friction in three core areas. That’s a lot of confusion, which requires a lot of education and proper communication on our end to help alleviate it. We’ve already been addressing a lot of these friction points with the launch of our new website. In fact, we have a separate process page as well as videos throughout the site to clarify how we help organizations, what motivates us, and how we have achieved great results for many different companies over the last 15 years. When you were working on your flywheel homework, you determined the metrics you were going to track at each stage. After it’s been spinning for about three to six months, how does it look? If you were using similar metrics in your funnel, how does it compare? If it’s a new metric, is it providing the momentum you were looking for to move people to the next stage? And what about word-of-mouth, referrals, and promoters? Are you seeing more of this activity? It may take some time before you see huge swings, but the flywheel makes sense if you think about it. The flywheel relies on the number one rule of business—the customer always comes first. And if you make that your main focus, then the sales will come second, third, fourth, and keep on spinning.